If you have an XML compatible RSS reader, you can subscribe here. April 4th, 2007 special feature: Last Ninja in action - Screenshots and movie clip of the Coco 3 version of Last Ninja (unfinished, unreleased) in action! Taken at the Chicago CocoFest 2007 on April 2. Thanks, Allen Huffman! 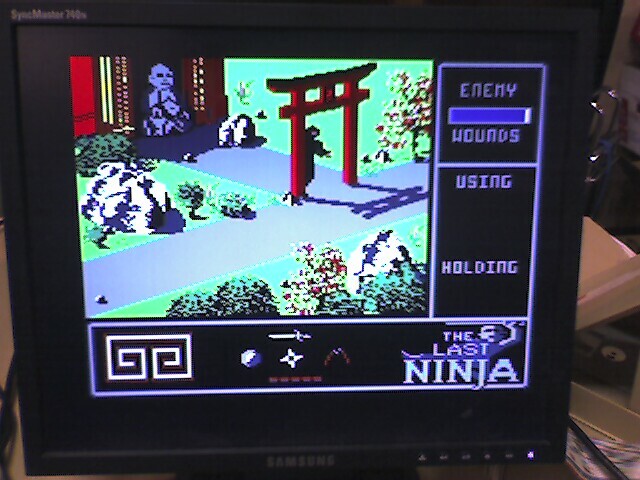 Last Ninja screenshot Last Ninja screenshot #2 Last Ninja movie clip of game in action - viewable with Quicktime, commentary by Allen. Total of 531 games listed, 159 available for download. Added: Author's name to Touchstone. -Added: 3D Space Wars, 7 Card Stud, Jubilex (includes download), Rommel&apos;s Revenge. Total of 527 games listed, 158 available for download. Total of 526 games listed, 158 available for download. Total of 525 games listed, 157 available for download. -Removed: Gold Runner 2000 game download, by request of the author. Total of 525 games listed, 158 available for download. -Added: Pac-OS9 (includes download and source code). Total of 524 games listed, 157 available for download. -Updated: Added real author to Sinistaar. Click here to see a list of older updates. This page is dedicated to all Coco games (Coco 1, 2 or 3) put out by any publisher, including PD and shareware releases. I have tried to document some information on each (if I know of anything... if anybody out there has additional information on particular games, please email me, and I will update the information page). This page is in alphabetical order, and each link will take you to a page dedicated to that particular game title. There are usually at least two screenshots: one of the opening title/credits screen, and one of the game in action. Also listed will be system requirements, publishing date (year), the publisher and/or author (if known), and then a general description of the game. Occasionally, there will be tips/tricks for the game as well, and if the game has been released publically by the author, a download link will be provided as well. Please note: in order to get some of the screenshots, I have had to use hacked (or cracked) versions of the games. If anybody can get 'clean' versions of the screenshots (particularily title screens) using either emulators or a real Coco, please email attach them to me using the email link above. I would prefer to get screenshots in either GIF or PNG format, so that color's stay consistent (JPEG's are notorious for introducing 'extra' shading, etc. on these normally small amount of color screenshots). If you are the author of any of this software, and you wish to release the programs publically so that any current/ex Coco owners can play all the games that they saw advertised in their youth, please email me to let me know, and if your program(s) is one of the ones that was hacked, please attach a proper version if possible. I would much rather devote these pages to the authors, not the people who broke their programs. I believe someone else is setting up a 'hackers' page to show some of the colorful names, etc. that hackers used, but I am not directly involved in that project. Even if you are not willing to release the game, if you want to contribute any special notes, concering the game's concept, development, little hidden tricks, etc., please do so. A note: some of the download games are archived, mainly to both save space, and to keep multi-file games together. If you find *.ARC file for Disk Extended BASIC (DECB or RS-DOS are other popular names for it), then you will need to download the TC3.BIN program as well, to extract the files. 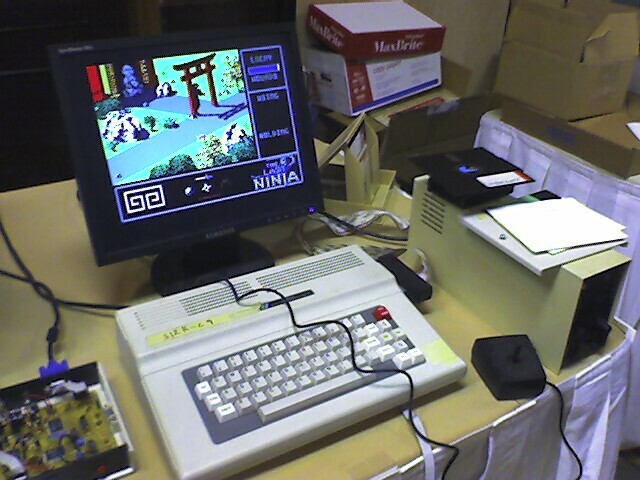 If you are getting an OS-9/NitrOS9 game, it will be archived with either AR (extension .AR) or LHA (extension .LZH). AR is a stand alone program, but LHA is actually two files. You can download these below, if you do not have them already. Download TC3.BIN (Program to extract .ARC files for RS-DOS). If you are downloading ZIP files (which will usually contain .DSK image files), and you want to extract them on your Coco using OS-9 or NitrOS9, you will need at least 256K of RAM, and two programs installed in your CMDS directory: UNZIP, and FUNZIP (You will have to rename them from *.bin yourself). Set the execution attributes on both of these programs, and then use UNZIP to extract files (FUNZIP is a subroutine package for UNZIP; don't run that program directly). John Kowalski, Richard Kelly, Ken Kalish, Ron Krebs, Doug Kelley, Brian O'Neill, L. Miller, Stephen Macri, Mike Burton, Kevin Derby, Greg Helton, Nickolas Marentes, Charles Price, Jim Peasley, Jeffrey Lampert, Steve Hartford, Chet Simpson, David Bush, David Shadoff, Rob Lech, Troy Dahlman, Jim Kearney, J. Weaver Jr., Daron Stinnett, Rick Lamont, John Strong, Jim Hurd, Scott Adams, Sylvain Payeur, David Crandall, Mike Hughey, Bill Sethares, Dave Dies, Jeff Noyle, Steven Hirsch, Harvey Brofman, Leo Christopherson, Ottmar Bochardt, Bob Crispen, Craig Stewart, David Clark, Charles Forsythe, Charles A. Husack, Matt Harper, Roland Knight, Roger Schrag, Tim Kientzle, Darren DeLoach, Lance Micklus, Greg Zumwalt, Brian Palmer, Jeremy Spiller, Greg Miller, Steve Strowbridge, and anybody else I have forgotten. See a list of emails releasing Coco game software... and, in some cases, some tips into the development/background of the games from the author's themselves!